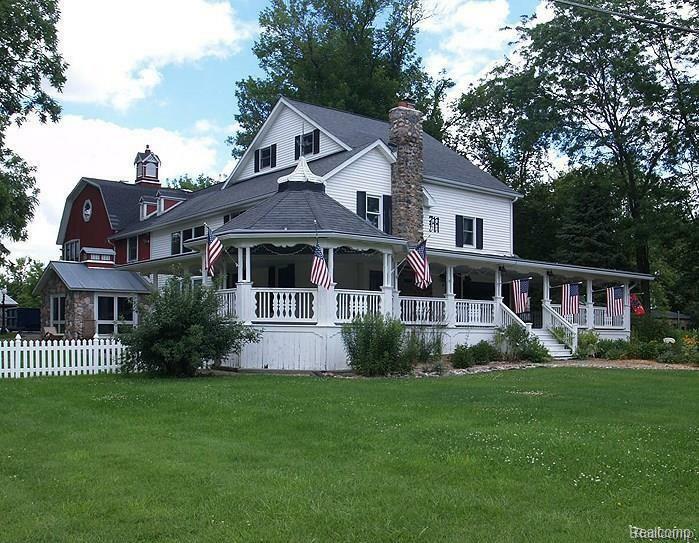 Car collectors (paved roads/ 12 + parking spots), horse enthusiasts (multiple organic pastures and stalls), micro farming and more on this over 14 acre parcel! Charming turn of the century farmhouse with all of the amenities of a new build but with so much character. Wrap around covered porch provides an outstanding venue for entertaining and family events. Brick paver walkways, perennial gardens, mature trees and close proximity to the Pinckney Recreation area. Hiking, biking, and boating is just minutes away. Home has a pond and a view of a small lake. The out buildings provide options for all of your hobbies and ideas! Zoned heating and cooling (high efficiency) run throughout the home. The stone gas fireplace in the living room is just gorgeous. The "Pottery Barn" decorating and generous room sizes provide a welcoming and relaxing environment. This home is all that you have dreamed of. No associations w/ lots of freedom to do what you want to. Gorgeous inside and out. IDX provided courtesy of Realcomp II Ltd., via Rock Realty Llc and Realcomp, ©2019 Realcomp II Ltd. Shareholders.